* Ticket prices increase at Disney resorts. A 1 day, single adult ticket to Magic Kingdom is now $105 plus tax. Epcot, Hollywood Studios, and Animal Kingdom tickets are now $97. Disneyland and California Adventure cost $99. Adding the park-hopper option is now $56. * Pirates of the Caribbean at Magic Kingdom will close through the summer due to safety concerns. * The Main St. Plaza Gardens West has opened in the Magic Kingdom. The new area has a fountain, landscaping, and an astroturf lawn. It will be used as an area to view fireworks using Fast Pass Plus reservations. * Epcot’s Flower and Garden Festival begins next week. * Dapper Days, where you dress your best and enjoy a day at the parks with other spiffy people are here: Disneyland on Sunday March 1st and Magic Kingdom on Saturday March 14th. * New Village Causeway has opened at Downtown Disney at Walt Disney World. * ESPN’s “Mike and Mike” will be recording their 15th anniversary show at Downtown Disney at WDW on March 6th from 6 – 10 a.m. * The Atlanta Braves begin Spring training at ESPNs Wide World of Sports complex. * DVC Polynesian Villas and Bungalows 7-month reservations opened 2/25/15. * Erin McKenna’s Bakery NYC opens at Downtown Disney at WDW. * The new “Kitchen Magic with Mickey” Disney Cookbook has gone on sale at Disney Parks featuring 100 favorite recipes from the parks, resorts, and Disney Cruise Line. * The Disney Fantasy was named Best Large Cruise Ship for the second straight year by Cruise Critics 2014 Cruise Choice Awards. It also took best in Large Ship Cabins, Best Dining and Best Family Ship. * The Disney Wonder won Best Midsize Ship. * The Disney Dream was named Best Overall Cruise Ship in Large Category. * Disney’s “Big Hero 6” won Best Animated Feature Film at the Oscars. * Disney’s “Feast” won Best Animated Short Film at the Oscars. * Ducktails will return to TV with a new series in 2017 on Disney XD. each ride, except for Winnie the Pooh. Even though I love the look of the WDW version of Fantasyland, it is still mostly a Medieval fair tent theme. The rides in Fantasyland were excellent. Mr. Toad’s Wild Ride was my favorite ride at either Disneyland resort park, and in my top five of all six Disney parks I have been to. Peter Pan’s Flights was closed for renovation also, but since it is my favorite ride of all the six parks I am confidant it would have been great. Pinocchio was a great surprise; Snow White was disappointing, but fun; and It’s a Small World was great, and even better then the WDW version. Also, there were the canal boats, and the Casey Jr. train which were both fun. ( My mom has gone into a bit more detail about the boats in an earlier post. ) Overall, Fantasyland here was my favorite land. To re-iterate, Fantasyland at WDW is better because of the addition of the new Fantasyland section, but I feel that without this addition Disneyland’s Fantasyland is better. Today I am going to review The Disneyland Hotel. We stayed there for five nights during our visit to Disneyland. It is one of only three resorts on the actual Disney property, although there are several “partner” hotels that provide bus transportation to the parks. This is in contrast to Walt Disney World that has a multitude of hotels with different price points within the confines of Disney property. The Disneyland hotel is the only one of the three hotels that Walt Disney himself actually set foot in and had input into its design. Paradise Pier is one of the other three that has a beach theme but doesn’t get the best reviews compared to the other two. The Grand Californian is the newest of the three and is quite impressive in the lobby and common areas (comparable to Wilderness Lodge and Animal Kingdom Lodge.) I will review it in another post. ilton property although with Disney theming. There were teacup chairs (from Alice in Wonderland) to rest in, pictures of the famous people who had visited Disneyland, two gift shops and a large picture of what the original Disneyland Park looked like. Outside there are three restaurants (a quick service dining option, a character breakfast option called Goofy’s kitchen, and a more expensive option called Steakhouse 55.) There is a nice pool area with a monorail themed slide. Unfortunately, the slide was closed during our stay. The room was renovated and great for a Disney fanatic like me. The headboard was wood with Sleeping Beauty’s Castle carved into the wood. When you flicked a switch on the light, “A Dream is a Wish Your Heart Makes” would play and the headboard would light up to look like fireworks were going off over the castle. The headboard spanned both queen beds and was really unique. Other Disney touches were the lights in the bathroom were held up with Mickey hands, the handles on both the bathtub and the sinks were shaped like Mickey heads, Mickey heads in the carpet, Walt Disney’s picture in Disneyland, and a few other things. Each night we returned to our room to find our beds turned down with mints on our pillows. This was a nice and unexpected touch. In addition to the inside descriptions, it is worth noting that it is connected to Downtown Disney and is just a short walk through Downtown Disney to both California Adventure Park or Disneyland Park. There is also a route through the Grand Californian straight into California Adventure Park and easy access to the monorail which zips you non-stop to Tomorrowland in under 5 minutes. In summary, we were very pleased with our hotel due to all of the Disney touches as well as the proximity to the park. * Disney Princess Half Marathon is this weekend on 2/22/15. A live stream will be available starting at 5 a.m. on runDisney and Disney Parks Blog. The race passes through both Magic Kingdom and Epcot. * Epcot is set to introduce “Streetmospheres” actors to the Japan pavilion celebrating Tokyo’s Harajuku neighborhood where young adults wear unique fashions. * More details of Disneyland’s 60th anniversary festivities have been released. – Sleeping Beauty Castle and Carthay Circle Theater will have sparkling , diamond makeovers. – A new Disneyland fireworks show, “Disneyland Forever” will combine fireworks with the largest installation of mapping technology at any Disney Park. – Disneyland “Paint the Night Parade,” like at Hong Kong Disneyland, will premiere featuring 1.5 million LED lights, with Disney and Pixar characters. – At Disney’s California Adventure starting on May 22, a special World of Color, called Celebrating the Wonderful World of Walt Disney” will premiere. * Hong Kong Disneyland’s phase 2 will soon be started and is estimated to be completed in 2020. * Sanuk, a division of Decker’s brand, has opened at Downtown Disney at WDW. * DVC properties, Disney’s Beach Club Villas and Disney’s Boardwalk Villas will undergo refurbishments and improvements this year. * Anna, Elsa, and Kristoff from “Frozen” will join passengers from Disney Cruise Line’s Magic for on-shore excursions to Alesund, Norway. * “McFarland USA,” the true story from Disney movies of a 1987 high school cross country team opens today. It rates 77% positive reviews on Rotten Tomatoes. * “Pirates of the Caribbean: Dead Men Tell No Tales” begins production. Cars Land is a wildly popular part of Disney’s California Adventure. It is a replica of Radiator Springs from the movie “Cars.” In typical Disney fashion, no detail has been left out, down t o the Route 66 and oil signs hanging on the Radiator Springs Curios Shop. The Cars movie was never one of my favorites. I guess it is because I am neither a fan of Nascar nor country music. I was looking forward to seeing Cars Land, but was not overly excited or really expecting a lot. It turns out, though, that Cars Land was my favorite part of Disney’s California Adventure. The theming is incredible, one of the best “l ands” Disney has to offer. You feel like are in Radiator Springs. From the detailed reproduction of the entire town, to the canyon walls and rock formations, to Mater and Lightning McQueen cruising the streets, you are completely drawn in. Not only is the theming spot on, but, the attractions are top notch, too. Luigi’s Flying Tires was a bumper car ride in which you float like an air hockey disc. I say “was” because, as of this week, it has been closed for good. It will be replaced by a new Dancing Cars ride. Mater’s Junkyard Jamboree is the second. You ride in a wagon, pulled by a tractor as it square-dances to the singing of Mater. I was utterly surprised at how much I enjoyed this ride. It is fun and silly, being slung side-to-side while listening to the comedic calls of Mater. Lastly is the Radiator Springs Racers, my favorite California ride. It is built on the same ride system as Epcot’s Test Track, but this attraction is far superior. You are a race car preparing for the big race. You ride through the desert hills and then through Radiator Springs, preparing for the “big race,” interacting with characters from the movie along the way. Then you zoom through the race. This ride has it all, theming, scenery, comedy and thrills. Dining optio ns are the Cozy Cones, Filmore’s Taste-In, and Flo’s V8 Cafe’. Cozy Cones offers cone themed snacks. Filmore’s has drinks and fruit. We ate at Flo’s, which is a classic, diner-style, quick service restaurant. Your order at the register and then take a seat inside the diner or pull up to a gas pump table outside. Again, the ambiance is great with diner decor, views of the cliffs, and classic 1950s hits playing on the jukebox. We tried three of the entrees . Perdita and I shared the rotisserie chicken and the turkey dip sandwich. The turkey was excellent. We neither one were impressed with the flavor of the chicken. Roly didn’t breath or speak until his roast beef and cheddar was gone. He gave it a thumbs up. The side dishes were all tasty. Overall, it was a wonderful dining experience. Sarges Surplus Hut, Ramone’s House of Body Art, and Radiator Springs Curios offer Cars related shopping and souvenirs. We thoroughly enjoyed Cars Land and can’t wait to go back. Cars Land is what sets Disney’s California Adventure above Hollywood Studios. I do not believe that it would work at WDW, though. Radiator Spring Racers is too close to Test Track and the Route 66 theme just fits better in Southern California. Maybe extending the Toy Story area like at Hong Kong Disneyland and/or making a Star Wars Land like rumored will bring Hollywood Studios up to par. Before I make my list, let me explain that I am a thrill ride junky. I love rushes of adrenaline. The two most important things to me in a ride are thrills and theming. The perfect ride has both, but I will almost always take thrills over themes. So, I like dark rides, but they are not at the top of my list. When we were at Disneyland, the Matterhorn, Spla sh Mountain, Soarin’ (one of my favorite rides at WDW), and Grizzly River Rapids were all closed. I was sorely disappointed and will be unable to assess them. Soarin’ at least would have made my list. 1. Radiator Springs Racers- This ride has it all: theming, scenery, comedy, and thrills. One of the best on either coast. 2. Space Mountain – In my opinion, the Disneyland ride is not as good as the Magic Kingdom version. It is a different ride except in name and theming. I prefer the Magic Kingdom queue, roller coaster, and exit. There is not near as much to focus on during the entry and exit with most of it being outside. It is a different ride with side by side seating, instead of sled style. It is smoother and has music blaring. It is still a great ride, though. I enjoyed more the second time after I had gotten over my expectations. 3. Tower of Terror – It is not an exact replica of the Florida version. The difference is from entering the elevator until the drop. The WDW version is better, but this one is still great. 4. California Screamin’ – This is an excellent roller coaster. The theming is weak. It offers great views of the parks and surrounding area including the mountains. 5. Mister Toad’s Wild Ride – It has great theming and a surprise ending that warms you up. Roly’s fervor for this ride pushes it onto the list. 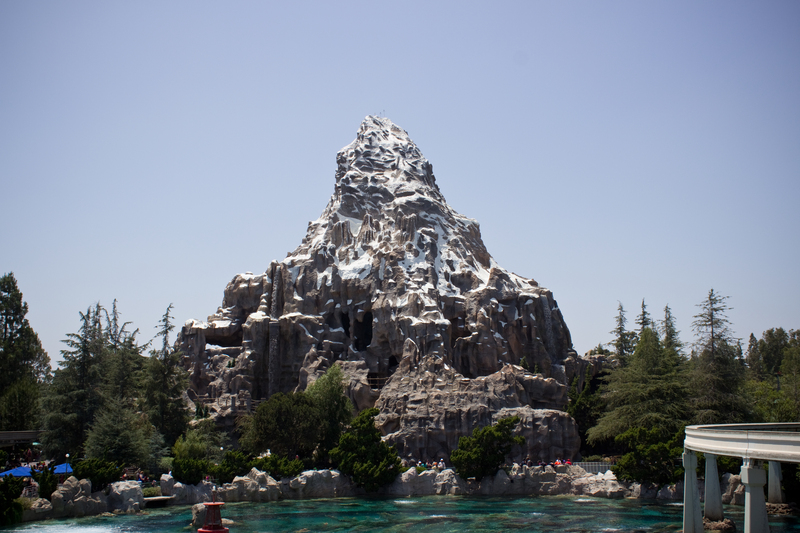 Today I am going to give my five favorite attraction/rides at Disneyland. In no particular order: Alice in Wonderland, Pinocchio, Small World, Mr. Toad’s Wild Ride, and Radiator Spring’s Racers. Only one of these is at Walt Disney World and it is Small World (though quite a bit different than at WDW). A sixth attraction I have to include is The Storybook Land Canal Boats. I would have a hard time picking a favorite so I won’t put these six in order. I favor the “dark rides” like Pinocchio, Alice, and Mr. Toad. These three are great at providing an escapist fantasy feel taking you through parts of the movie with imagery and sounds that Disney does superbly. I left the rides every time with a smile on my face and ready to get on the ride again. The Small World ride was similar to the one at Walt Disney World but with the added enjoyment of some of the audio-animatronics being classic Disney characters. As you glide by the United Kingdom section you see Alice and the white rabbit from Alice in Wonderland, Peter Pan and Tinkerbell from Peter Pan; Pinocchio from Italy; Lilo and Stitch in Hawaii; Cinderella, Jaq, and Gus-Gus in France and many more. Radiator Springs Racers was an unexpected adrenaline rush as well as a scenic delight. I felt I was in Utah or in some ways back in Colorado at Garden of the Gods while our ride started out slowly while stopping by a waterfall for the first outside portion of the ride. We were then immersed into some scenes from the movie Cars (where the ride is located in Cars Land). We then lined up next to another car in the next lane and the “thrill ride” portion of the ride began as we took off driving around curves and up and down hills. This portion of the ride was worth the wait. It was over too soon as so many Disney rides are. The Storybook Land Canal Boats provided a ride past such montages and miniatures as Arendelle, Elsa’s ice castle, Pinocchio’s village, Cinderella’s castle, Snow White’s village and the seven dwarves mine, Toad Hall, etc. 1. Mr. Toad’s Wild Ride – This ride lived up to every one of my expectations. It is my favorite because it has the best looking scenes of any dark ride and the coolest concept. 2. Indiana Jones Adventure – This is now my second favorite “thrill ride.” It is not my favorite because the concept is not as original as Tower of Terror. The reason that I do like it so much is simple. It is like something out of “Raiders of the Lost Ark,” with great effects and classic traps such as the huge, rolling stone. 3. Alice in Wonderland – This ride has the best effects of any dark ride, except maybe HauntedMansion. The use of mirrors to make it look like there are more of the Queen of Heart’s card soldiers and using screen instead of animatronics at some points is certainly different. 4. 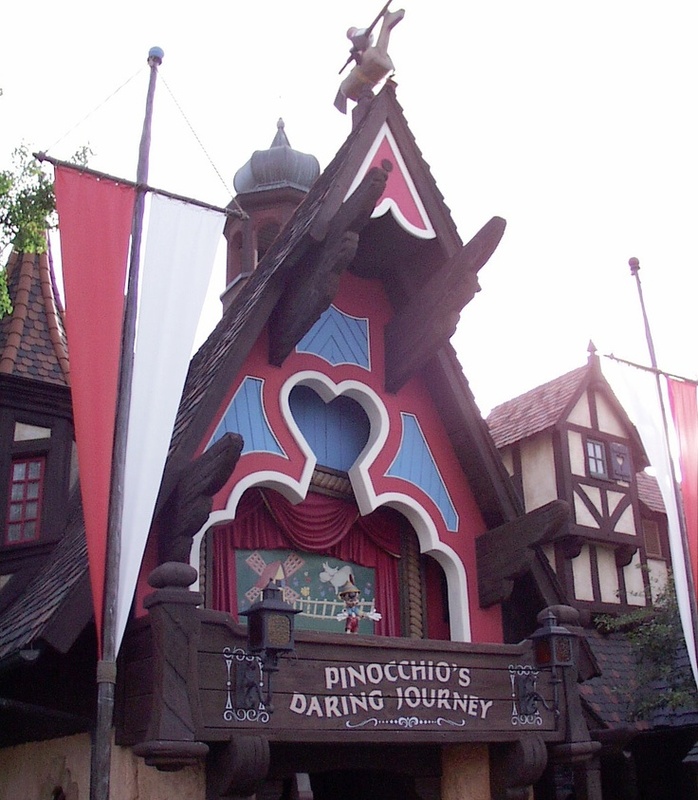 Pinocchio’s Daring Journey – I went thinking that this would be a dud but was very surprised. It is just a fun ride in general. In a way, it is surprising to me that it is so high on my list. It is not a thrill ride, nor does it have great special effects, but, it is fun watching how the whole story is played out. 5. Radiator Springs Racers – This is my only selection from Disney’s California Adventure. I do like the rides at the park, but there are not a many to choose from. I do love thrill rides, and the hills and fast banking in this ride are certainly a thrill. Even before the race sequence, though, there is a waterfall and other wonderful scenery and funny parts like Mater teaching you how to tractor tip. All of this makes for a very good ride. I just returned from my first visit to Disneyland. Our visit was only four days but I feel like I could write a book about this one experience as there is a lot to cover: comparisons to Walt Disney World, general impressions of Disneyland, reviews of the attractions, our stay at the Disneyland Hotel, etc. I will cover each in a different post, but today I will give my general overall impression of our visit. First off, I loved Disneyland. I went expecting not to like it but I was totally in love with the entire park by the end of our stay. There were many new things for us to do and new things to see. I enjoyed both California Adventure and Disneyland parks. The highlight was Fantasyland in Disneyland park and Cars Land in California Adventure. There were many attractions that aren’t available at Disney World. However, some of the most enjoyable things weren’t the attractions per se but the intimate feel of the parks. The setting of Main Street USA in Disneyland was gorgeous with abundant foliage, ample seating, and good restaurants. We rode a horse-drawn carriage while being serenaded by the Dapper Dans (a barber-shop quartet group) who was riding with us, rode a double- decker bus, listened to a jazz band, a piano soloist, and just enjoyed sitting on a bench and relaxing in the sun. The more time we spent in the parks the more charm we discovered. 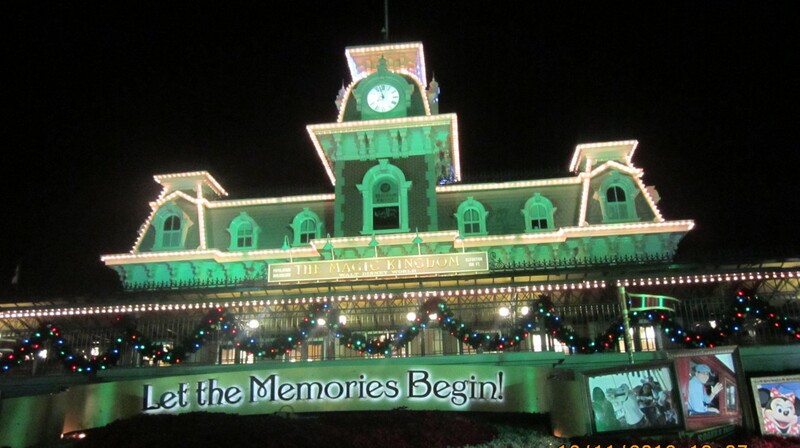 In my next post I will cover our visit in more depth and hopefully illuminate the “Happiest Place on Earth” a bit more.